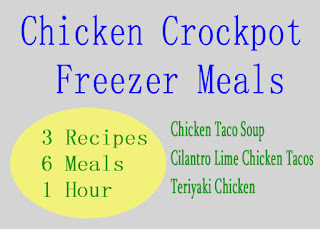 Double these 3 simple chicken recipes, and you can have 6 freezer meals in less than an hour! All meals have been taste tested and approved by my kids! Serve with with sour cream, shredded cheddar cheese, and/or tortilla chips. 3. Shred chicken in crock pot once cooking is done. Serve with with sour cream, shredded cheddar cheese, and/or tortilla chips. Serve with sour cream, guacamole, salsa, or cheese on with tortillas or on top of salad. 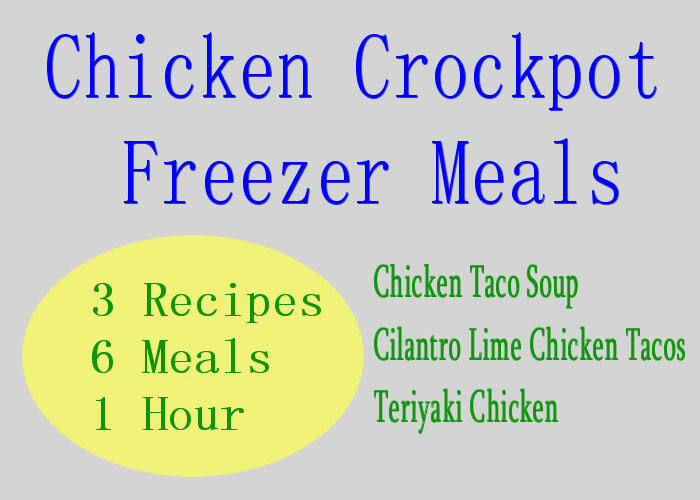 1.When ready to eat, remove from freezer and thaw in fridge for 24 hours. 2.Put contents of bag in Crockpot, and stir in 2 Tbsp of Olive oil. 3.Cook on LOW for 8 hours (or HIGH for 4 hours). Shred Chicken with Fork. 4.Serve with tortillas and toppings such as with sour cream, guacamole, salsa, and cheese. 1. Label your bags with cooking the directions. 2. Trim chicken breasts and cut in half to have a total of four pieces of chicken per bag. Add to bag. 4. Add rest of ingredients to bag. 5. Let out air, seal bag, and lay flat in freezer. 2. Cook on Low 6 hours or High 3-4 hours. 3. Stir in stri fry veggies and serve over rice.